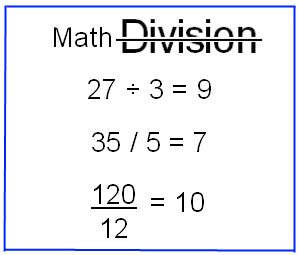 Math division separates a number into equal quantities. The resulting number is equal portion to the number divided. The number divided is the dividend, the number dividing is the divisor. It is based on repetitive subtraction and is the opposite of multiplication. b) Division by zero is undefined, never divide by zero (5/0 is undefined). c) The result of division by 1 is equal to the number divided: 5/1 = 5. A negative number divided by a negative number is positive. e) The result of division is its quotient. Long division is a simple and convenient method to divide positive whole number integers. It is the first math division method that most of us learn. Suppose we have 60 apples and 5 baskets. How many apples should be placed in each basket so that each basket has the same number of apples? Quotient - result of division. Tableau - a division symbol. Place 12 Apples in each basket. Find the greatest whole number that 5 can be multiplied resulting in a product less than or equal to 6; (5 • 1 = 5). Write the 5 beneath the 6 of the dividend and place a minus sign in front of the 5. Place multiplier of 5, the 1, as the first digit of the quotient. Place a 0 after the 5 for each digit of the dividend. Subtract the 50 from the dividend 60. Place the 5 multiplier, the 2, as the second digit of the quotient. Write the result 10 with a minus sign. Subtract the 10 from the 10. The remainder 0 is less than the divisor 5. The math division is complete. Write the remainder in the quotient. The negative of 14 • 6. Remainder 12 is less than divisor 14. Find the highest number that 14 can be multiplied that results in a product less than or equal to 96; 14 • 6 = 84. Subtract 84 from 96: 96 - 84 = 12. The remainder is 12, it is less than the divisor of 14. The above division remainder is identified as “R”. This is elementary division. The remainder is actually a fractional quantity: To convert to fraction form; take the remainder and divide it by the divisor, therefore, 12/14. The answer is then written as 6 + 12/14 or reduced to 6 6/7. Remainder is stated as a fraction. A mixed number is an integer combined with a fraction. To divide mixed numbers the integer value must be combined into the fraction. The numerator will be larger than the denominator, an improper fraction. Seven can now be divided by four.